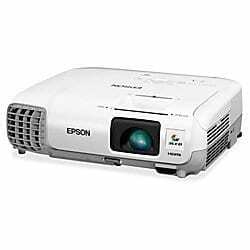 HD Projector rentals create professional level HD presentations and slide shows during lectures and business presentations. They also create atmosphere at parties by projecting onto white walls, both indoors and outdoors. Many people use projectors to share their photos with their guests, especially in the case where the wedding has already taken place. Our favorite application for this projector is to create your very own outdoor and indoor movie theaters, which are loads of fun. We recommend a sound system, however this rental does have a modest built in speaker which is suitable for intimate presentations in small spaces. Please see our PA and Sound Systems here and our Movie Rentals & Red Carpet Event Rentals here. 3D capable: Able to display immersive images with stunning detail (RF 3D glasses required, not included and not a rental item). *This item includes 2 HDMI (1 MHL), 1 composite RCA, 3 component RCA, 2 stereo RCA, 1 PC, 1 USB and 1 RS-232c. MHL connectivity allows simple interface with MHL-enabled tablets and mobile phones.